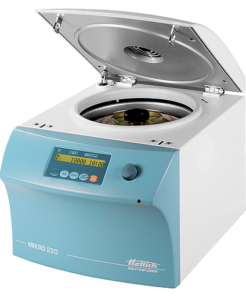 Micro centrifuge models offer variety and high performance in a quality compact package. Our compact micro centrifuges are available in three varieties and are coupled with multiple rotor choices to accommodate a diverse work-flow. Accessories are available for all micro tubes, spin column kits, conical tubes up to 50 ml, cryo tubes, pcr strips and all standard blood tubes. Autoclavable, phenol resistant, bio-containment lids are also available. Speed and capacity across the entire Hettich MIKRO centrifuge series. Whether you need a basic 24-place micro centrifuge (MIKRO 185) or a more advanced unit with greater capacity, rotor variety and optional refrigeration (MIKRO 200 / 220), our units are built for high-speed centrifugation for efficient and optimal performance. Robust and steady temperature control in a compact footprint. Our MIKRO 200 R (-10 to +40°C) and MIKRO 220 R (-20 to +40°C) centrifuges come with a quiet and reliable refrigeration system positioned at the rear of the unit. This maintains the compact width of the centrifuge and occupies minimal bench space. Process Lipemic samples and save thousands on equipment. Don’t struggle with the high-cost of processing lipemic samples. Process your samples quickly, in-house, and do away with send-outs with Hettich high-speed micro centrifuges. Run up to 24 microliter tubes, 12 pediatric tubes, or 18 spin column kits in a compact frame. High-performance with a max RCF of up to 18,845. Up to 30 micro tubes with high RCF for best sample results. Specialty rotor designed for spin-column kits. 4-place PCR strip rotor available. Up to 48 micro tubes with bio-containment. Wide rotor variety for tubes up to 50 ml. Spin lipemic samples for a fraction of the cost. Find all the latest documents, video’s, operators manuals and product information in our Resource Library. Interested in Hettich Micro Centrifuges? Complete the form below and let us know which model you think is best for you.